02.11.09 Processing workshop Processing CrasLab, Paris. 29.09.09 Processing workshop Processing ALBA – Beirut, Liban. 05.07.09 Processing presentation Processing Belo Horizonte, Brazil. 30.05.09 Processing workshop Processing Créasciences, Bergerac. 25.05.09 / 27.05.09 Processing workshop Processing Media cité, Saint-Médard en Jalles. 28.02.09 / 01.03.08 Atelier Openframeworks Openframeworks CrasLab, Paris. 24.02.09 / 26.02.09 La Chose Programmée Processing Mobile BBB, Toulouse. 16.12.08 / 19.12.08 Live Coding Vision Factory Hypermedia, Aix-en-Provence. 22.09.08 Processing tweak Processing School of Art and Design, Limerick, Ireland. 12.04.08 / 13.04.08 Processing workshop Processing CrasLab, Paris. 08.11.07 La Chose Programmée Processing Mobile Ecole des Beaux-Arts, Toulouse. 31.05.07 Processing + Arduino Processing, Arduino CrasLab, Paris. 04.06.06 / 06.06.06 Processing workshop Processing Media cité, Saint-Médard en Jalles. 28.05.09 Jeudi Multimédia #39 Studio 2Roqs presentation Rocksane, Bergerac. 23.03.09 Siana Code as creative tool Evry. 25.05.08 Web Flash Festival Cadavre exquis de code Centre Pompidou, Paris. 10.04.08 Jeudi Multimédia #29 Présentation de Vision Factory Médiathèque de Camponac, Pessac. w/ Tuff Wheelz + BusyP + So-me + DJ Mehdi Vision Factory Quatre cent, Bordeaux. 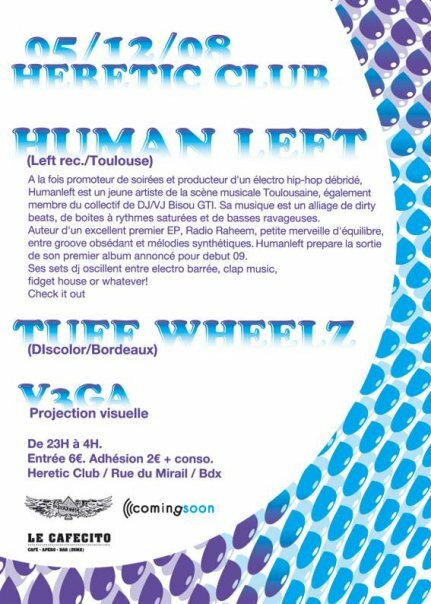 w/ Tuff Wheelz + HumanLeft Vision Factory Heretic, Bordeaux. w/ Sevenfive Vision Factory Son’art, Bordeaux. w/ Sevenfive Vision Factory Des lendemains qui chantent, Tulles. 24.10.08 / 27.10.08 Etienne Cliquet’s Cyclope Processing Mobile Slick festival, Paris. 05.08 Etienne Cliquet’s “Déplié International” Processing Mobile Cité Internationale Universitaire de Paris.